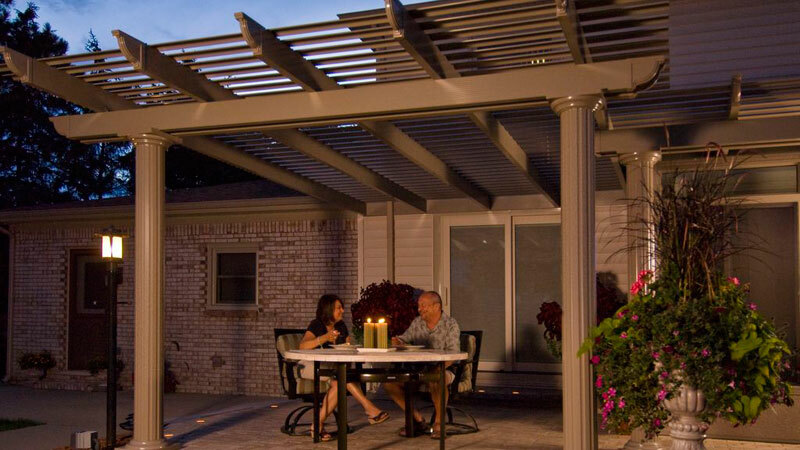 Create the perfect ambiance for an outdoor dinner party, cookout or other gathering underneath a cozy pergola, the perfect overhang that makes your space feel open, airy and inviting. With a brand new pergola from U.S. Patio Systems, you can enjoy the natural light outdoors from the comfortable shade created by its elegant rafters. Our pergolas are manufactured by TEMO, a leader in the industry that set the golden standard for style, quality and performance. Not only will your pergola add visual interest to the exterior of your home, it will also be built to last—TEMO constructs them from heavy-duty, high-strength aluminum for added durability. Design an outdoor space that’s as comfortable as it is attractive. TEMO pergolas also feature a unique curved lattice system that offers additional sun protection beyond other models. A pergola adds a luxurious touch to any outdoor environment. With years of experience designing and installing pergolas, U.S. Patio Systems is the clear choice to upgrade your outdoor experience. We also offer sunrooms, patio covers and screen rooms in a variety of styles. For additional information, please contact our expert staff today.